If I have the time, I hold lectures on the wide and very interesting subject of perfume. I tell about perfume traditions as well as my own experiences through my multifaceted journey that never seems to end. Listen to the perfume's history, the craft behind the scents and its importance to us. It's more exciting than you can imagine! Send an email to info@prodottiditoscana.se for more info, if this would be interesting for your set? Essential oil fragrance with warm and embracing tones. 250ml and 500ml glass bottle + reeds. Room spray, 100 ml with different lovely scents. Eau de Cologne, 500 ml glass bottle with different fantastic scents. Eau de Parfum, 100 ml natural spray with different wonderful scents. Vero Toscano is created by the perfumery Wally, founded in 1925, and consists of two Eau de Parfums 50 ml, one in white packaging – "Bianco" and one in black packaging – "Nero". 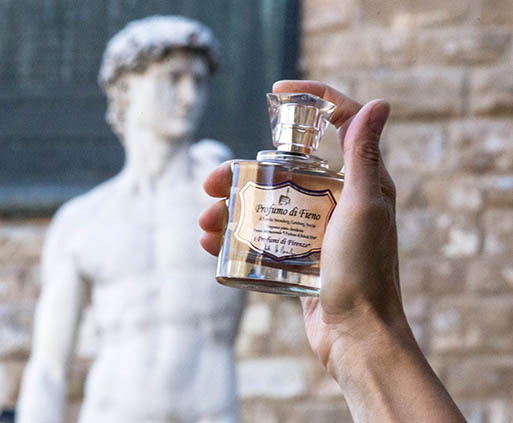 Vero Toscano tells a story about a place and region of Italy, and the scents are both sensual and exciting. Eau de Parfum Vero Toscano Bianco is fresh, floral, powdery, woody, mossy and sweet. Top notes: Orange, Bergamot, Heliotrope Middle notes: Lily of the Valley, Rose of Damascus, Gardenia, Gurjun balsam Base notes: Sandalwood, Ebony, Cedar wood, White moss, Vanilla Eau de Parfum Vero Toscano Nero has oriental, spicy and woody notes. Top notes: Sicilian lemon, Indian red berries, Star anise, Calabrian bergamot, Cardamom, Cloves, Grapefruit Middle notes: Jasmine, Turkish rose, Cinnamon, Nutmeg, Violet leaves, Black pepper, Magnolia Base notes: Vetiver, Cedar wood, Patchouli, Vanilla from Madagascar, Moss from French wood. Shower cream, superior quality cleansing lotion with a spicy scent. 500ml bottle. Solid soap, gentle and moisturizing, pure "Savon de Marseille", olive oil and aloe vera soap. Liquid soap 500 ml in a bell shaped plastic bottle with pump and with lovley fragrances. Solid soap 1x300 g, completely made of natural ingredients, with exquisite fragrances and good quality.